Helm is a startup that wants to satisfy people who dream of having ownership of their email content. Companies hold your data on their servers; this Helm concept is the price you would pay for turning that around, where you manage your mail on a personal server. Consider that arrangement, and if it is in the best of worlds, where you have access to your mail. Consider composing emails all day and not having that uneasy feeling that outsiders leverage the mail content too. The private email server runs in your home. The box costs $499 for use for one year and there is a $99 annual subscription fee after that. Dan Goodin in Ars Technica said it's "a small custom-built server" connecting to the user's home or small office network, small enough "to be tucked into a drawer." The email system can send, receive and manage mail, contacts and calendars. Security watcher Lily Hay Newman in Wired: "You set up a Helm server in your house, office, or wherever with a mobile app, and can then access your own personal email server and cloud from all your devices anywhere." The Helm site explained the server process. The server automatically establishes a connection with the Helm gateway service to provide it with a static IP address (similar to a phone number for your server). "This service also handles all the network configuration required to run an email server out of your home. You'll then be able to configure your email clients on your mobile devices and computers to connect to the server just like you would with any other mail provider." The question appears in a FAQ section if the Helm Personal Server supported webmail. The answer was no, not at this time. "Instead, users can use clients for MacOS, Windows, Linux, iOS and Android." Helm's team appear to have gone all out to make their system extremely hard to hack. Adele Peters in Fast Company wrote that "The data, which is backed up offsite, is encrypted, and only the user can decrypt it." "Our implementations are audited by experts and assessed for vulnerabilities to ensure our devices are as secure as possible. We hire hackers to try to break into our product and will soon announce a bug bounty—a cash reward—to anybody who's able to detect vulnerabilities in the device," according to the Helm site. The Helm announcement comes at a time when there is a question hovering over e-mail services that are free, but at what cost? What outside parties are scanning mail contents? Dan Goodin in Ars Technica presented the downside: " The advertising model that makes this cost-free service possible means some of our most sensitive messages are being scanned for clues about who we are, what we care about, and what we do both online and offline." Giri Sreenivas, cofounder and CEO of Helm, told Ars he thought more and more people were realizing the cost of free and that "they give up their data, and companies like Google and companies like Facebook and others are figuring out anything and everything they can do under the sun to make money with that data and the corresponding online behaviors." Fast Company quoted him too as saying the Helm concept created a different paradigm. Srvinas is confident that "As more and more data breaches occur, people will want their personal information closer to home, especially as the convenience of doing that increases." Meanwhile, counter-reminders of the cloud-based advantage of leaving your email in the hands of the giants are also posed, and some may lean toward staying out with their existing email services because, as Peters referred to "fixing bugs, blocking spam, and otherwise maintaining your email server for you." Lily Hay Newman also appeared to think the uphill battle to win hearts and minds would be tough. "And in trying to market Helm to everyone, the company may also find it difficult to match the convenience of ecosystems like Google's. Users who rely on Helm will have to give up integrations like those between Gmail and Google Drive or Apple Photos and iCloud." In the Wired article, a suggestion coming from the Electronic Frontier Foundation's Jeremy Gillula, tech policy director, and White Kenn White, director of the Open Crypto Audit Project, hoped that Helm publish a transparency report and third-party audit assessments "to give users more insight into the service." Pro or con, Helm has helped all those affected by the digital life to understand some writings on the wall: "at the very least, Helm underscores the tension between data privacy and convenience, and the challenge of attempting to reconcile it in a new way," wrote Lily Hay Newman in Wired. Helm has begun accepting orders. 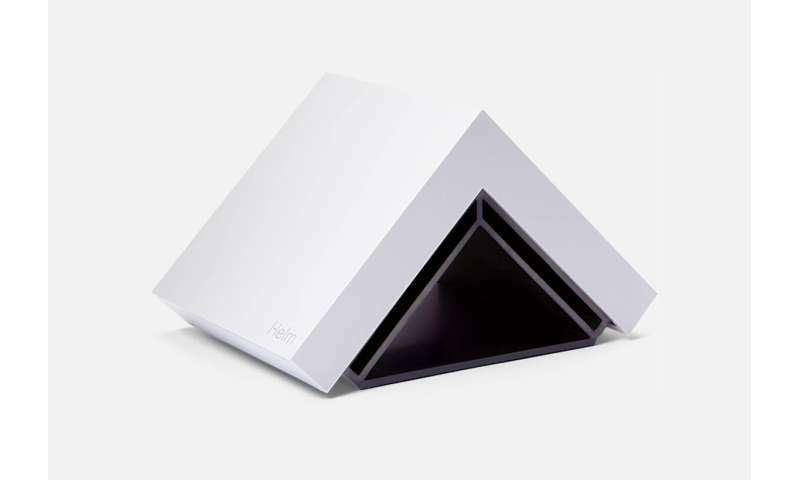 Helm currently ships to anywhere in the United States, said Helm, but "cannot ship to PO Boxes, Army Post Office (APO) or Fleet Post Office (FPO) addresses." 'Homebrew' email servers: Genius as well as sneaky? Looks like a solid turnkey solution. Maybe a bit pricey. I've contemplated setting up a server like this. A suitably outfitted Raspberry Pi should be up to the task. Their gateway does handle the problem of a static IP fully, but I wonder if it could not be adequately satisfied with a dynamic DNS to provide inbound routing and an outbound relay host somewhere to handle traffic from end-user address ranges which are rightfully blocked. (Thanks, spammers!!) Or just see if you can get a static IP from your ISP, hopefully without having to go to business class. I solved that problem years ago but simply getting my own webpage. It came with unlimited email addresses I could use and nobody reads my mail. Every Linux n00b and her dog know how to set up an email server on your laptop. For free. If you have a static IP you are golden. If not there are alternatives. And I don't think it's more difficult to set up one of these things than your own server on your box. The only problem with a private email server is that you're easily DDoSed off the web if anyone ever discovers your IP address.